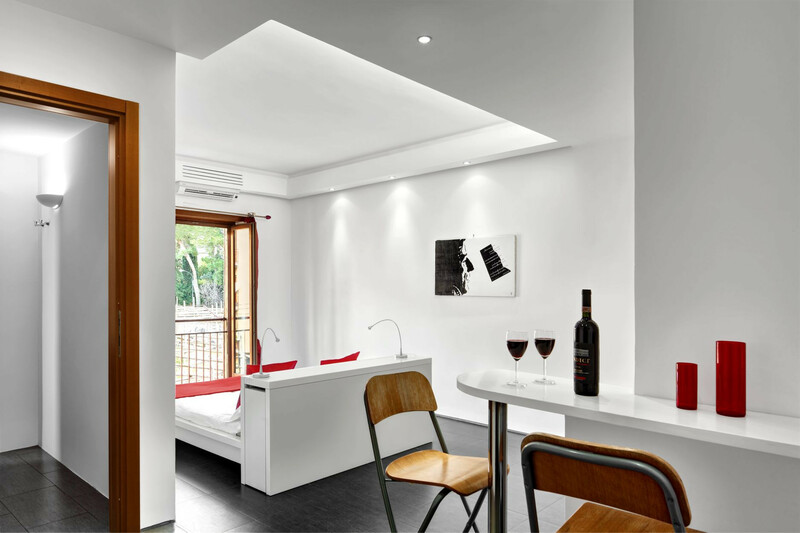 You’ll feel in the thick of the action when you stay in the D2 Apartment in the middle of Sorrento. Just steps away are the shops, supermarket, bars, cafes and restaurants enjoyed by the Sorrentine people. Immerse yourself in the local culture as you enjoy the experiences on your doorstep. The D2 Apartment is available alone for a party of 2-3, or in combination with the D1 and D3 Apartments within the same building to give a maximum of ten beds. 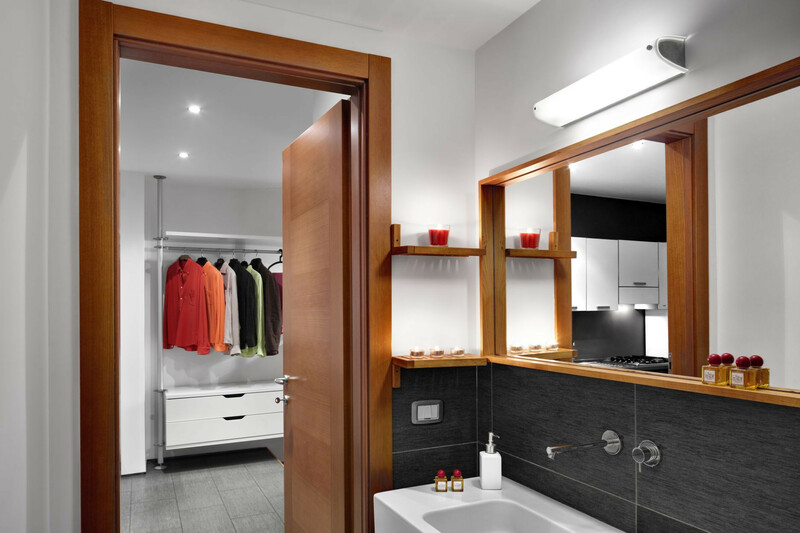 The D2 Apartment is situated on the second floor and is easily accessible by lift or stairs. 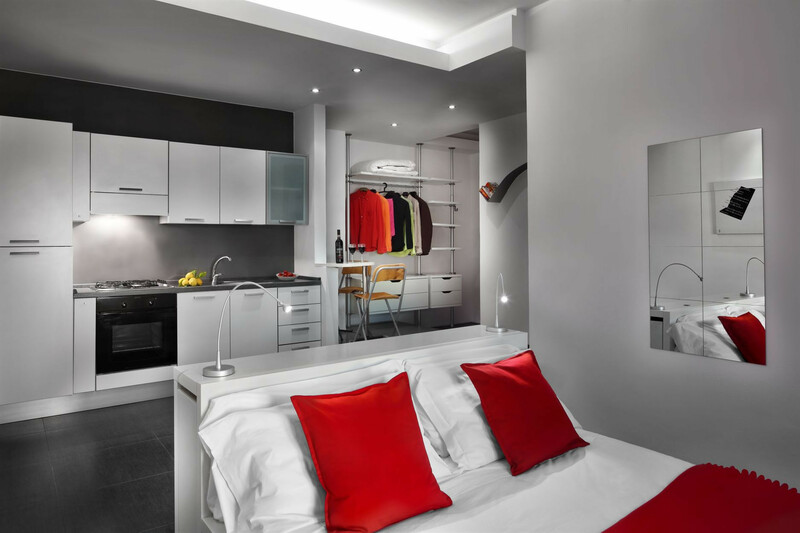 Cool and contemporary throughout, the apartment boasts quirky design touches and thoughtful mood lighting. It measures approximately 35m2. The generous double bed comfortably sleeps two. Relax in bed and admire the view from the picture window onto the gardens, or watch one of the hundreds of English satellite channels on the wall-mounted Samsung flat screen TV. 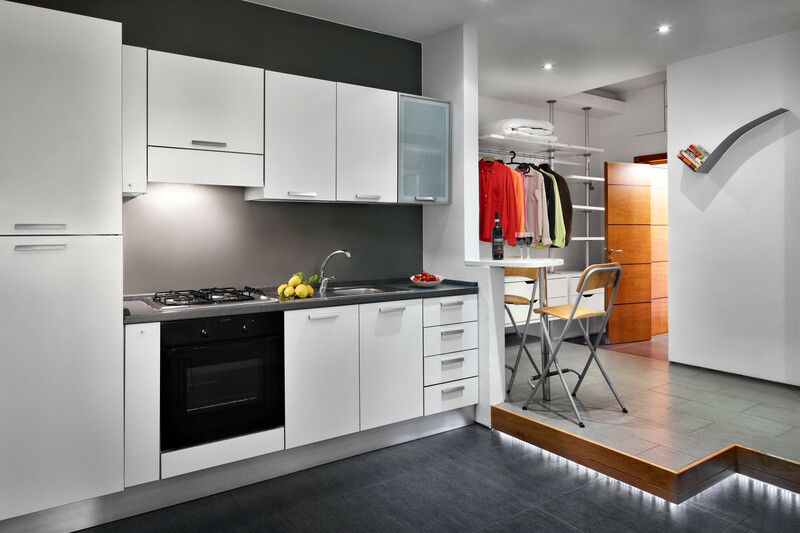 You’ll be impressed with the ample space for hanging and storing clothes and other belongings and an ironing board and iron is available to help you look your best. There is also a single sofa bed for an extra guest. The modern kitchenette gives you all you need to prepare meals or snacks, including a four-burner gas stove, oven, , full-size refrigerator and freezer and an Italian coffee maker. There is a breakfast bar with seating for two. The tastefully decorated bathroom has everything you’ll need including an enclosed shower, wash basin, toilet, bidet and hair dryer. You can keep cool or warm whatever the time of year, as the D2 Apartment is equipped with an upgraded air conditioning and heating unit. WiFi is available throughout the apartment. The D2 Apartment is very convenient for all of Sorrento’s public transport options, so you may not feel you need a car. In a nutshell, if you’re looking for the ideal base to enjoy Sorrento town and the surrounding area the D2 Apartment fits the bill. TV, TV Satellite, 2nd floor, internet (Wi-Fi), hair dryer, 40 m² property, central heating, air-conditioned. Great value and location. The host’s team met us at the property and explained how everything worked and gave tips for the area. Super quick to respond with the pre-check in and also when we locked ourselves out of the safety box. Thanks! Nous avons passé un très bon moment à Sorrento. L'appartement est parfaitement situé et irréprochable. Merci !